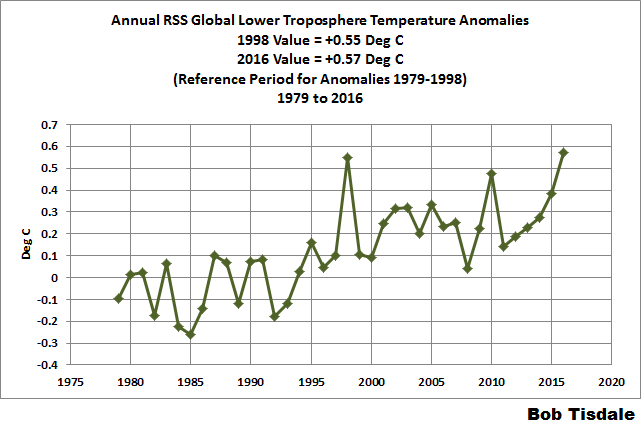 “The question is, does 2016′s record warmth mean anything scientifically?” Christy said. “I suppose the answer is, not really. Both 1998 and 2016 are anomalies, outliers, and in both cases we have an easily identifiable cause for that anomaly: A powerful El Niño Pacific Ocean warming event. While El Niños are natural climatic events, they also are transient. In the study of climate, we are more concerned with accurately identifying long-term temperature trends than we are with short-term spikes and dips, especially when those spikes and dips have easily identified natural causes. Compared to seasonal norms, the warmest average temperature anomaly on Earth in December was in south central China, near the town of Qamdo. December temperatures there averaged 3.91 C (about 7.04 degrees F) warmer than seasonal norms. Compared to seasonal norms, the coolest average temperature on Earth in December was near the town of Buffalo Narrows in west central Saskatchewan. December temperatures there averaged 4.13 C (about 7.43 degrees F) cooler than seasonal norms. The December 2016 GTR includes the global temperature anomaly map for the month and the month-by-month graph of global temperature anomalies for the duration of the satellite temperature dataset. It also includes a global map of the 2016 temperature anomalies, and a global map of the regional climate trends from December 1978 through December 2016. As part of an ongoing joint project between UAH, NOAA and NASA, Dr. John Christy, director of the Earth System Science Center at The University of Alabama in Huntsville, and Dr. Roy Spencer, an ESSC principal scientist, use data gathered by advanced microwave sounding units on NOAA and NASA satellites to get accurate temperature readings for almost all regions of the Earth. This includes remote desert, ocean and rain forest areas where reliable climate data are not otherwise available. Abbildung: Entwicklung der globalen Monatstemperaturen von Dezember 1978 bis Dezember 2016 basierend auf UAH-Datensatz. Quelle: UAH. Das Jahr 2016 war in Deutschland im Durchschnitt wieder deutlich wärmer, brachte aber keine neuen Temperaturrekorde. Was Niederschlag und Sonnenscheindauer angeht, erklärt der Deutsche Wetterdienst (DWD) 2016 zum durchschnittlichen Jahr. Auch in Bayern war es im Schnitt eher kalt und regnerisch. Und natürlich auch keine Rekorde in der Schweiz, wie auf zueriost.ch zu lesen war. Was die Weltmeteorologieorganisation WMO schon im November verkündete, bestätigt nun auch die US-amerikanische Wetter- und Ozeanografiebehörde NOAA: Die globale Mitteltemperatur erreichte dieses Jahr erneut Rekordwerte. 2016 wird weltweit das heißeste Jahr seit 1880 werden. Dabei überbieten die diesjährigen Temperaturen noch die Rekordwerte aus den Vorjahren 2014 und 2015. Ein Fall für die neue Fake-News-Stelle der Bundesregierung.